Proving that you can never rest on your laurels in a grand prix round the world race in one designs, in the three-way horse race to the Auckland finish line, it was the Spanish VO65 MAPFRE that finally took the lead at around 1700 UTC yesterday and clung on to arrive home first on this four leg from Sanya, China at 08:31:20 UTC in an elapsed time of 20d 02h 31m 20s. Incredibly after what was close to 6,000 miles of racing - the boats took a circuitous route some way from the great cricle, the top three boats finished into Auckland separated by just eight minutes, Abu Dhabi Ocean Racing claiming a deserved second at 08:35:45 UTC with Dongfeng Race Team third at 08:39:22 UTC. While MAPFRE earned her victory by remaining with the top group in the race restart to the east of Vanuatu earlier in the week, the Spanish VO65 eventually came out on top of the top three through the tactical prowess of her French navigator Jean-Luc Nelias who on the approach to the New Zealand coastline and the well forecast ridge that the boats would have to cross, urged MAPFRE further offshore than her rivals and was able to pull ahead of Abu Dhabi Ocean Racing and Dongfeng Race Team through sailing in better pressure. MAPFRE becomes the fourth different leg winner in the Volvo Ocean Race in as many legs, again a great testament to the new Farr one designs used by the teams. MAPFRE for this leg has been skippered by Spanish round the world veteran and two time Olympic 49er medallist Xabi Fernandez, with regular skipper Iker Martinez standing down from the last two legs to focus on his Nacra 17 Olympic campaign with Tara Pacheco. “Super happy, super happy," beamed Fernandez of their result. "It was a very tough leg, a very tough last few days especially. We were struggling with Abu Dhabi and Dongfeng at the beginning - we were a bit slower - and in the Doldrums too. And this morning we saw them very close and managed to pass them. Since then we led the whole way!" 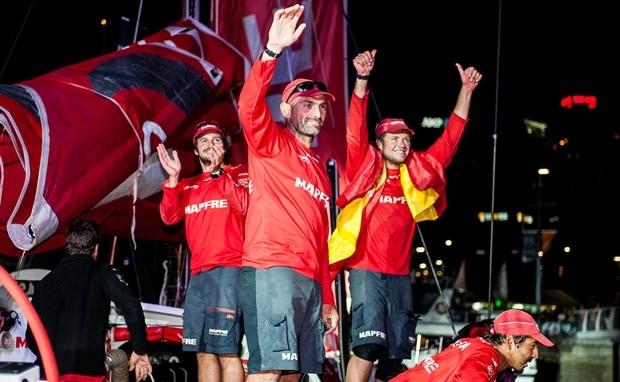 MAPFRE's result into Auckland makes up for a shakey performance in the Volvo Ocean Race so far, having finished last into Cape Town on the opening leg followed by two fourth placed finishes into Abu Dhabi and Sanya. It leaves the Spanish team tied on 16 points with Team Alvimedica (which came home fourth, 26 minutes after MAPFRE), while at the top of the leaderboard Abu Dhabi Ocean Racing and Dongfeng Race Team are back to being tied on points, with 8 apiece, but with the UAE nominally leading on countback. “We improved a lot during Leg 2 and Leg 3, but we were still doing some mistakes," says the Basque sailor. "We have a very good team to do well and I hope we’ll keep doing like this." During the leg the MAPFRE crew, that includes British sailor and past winner Rob Greenhalgh, found themselves without full communications because of a temporary problem with their antennae. This caused them to miss crucial weather data until they were eventually able to fix the issue. They also suffered a major injury problem on board when under-30 crew member Guillermo ‘Wily’ Altadill badly hurt his hand. It was put in a splint and Altadill, 22, will see a doctor on Sunday to discover if he has broken it.